Examine the 14 powerful features law firms use to enhance their professional image, gain greater efficiencies and save money with Adigo custom conferencing. There isn't a one-size fits all when it comes to effective and professional conferencing. 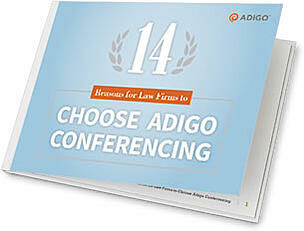 This resource makes a compelling case for why your firm should choose Adigo custom conferencing! Get The Free Resource For Your Firm Now!